Description: The front half of DH 7405 enjoys the sunshine on this late August day. Description: D&H C628 604 lined up with GP39-2 7405 (ex-RDG 3405) and SD45 803 (ex-EL) at Binghamton, NY. Description: 7405 at the service tracks in Oneonta. Description: Delaware & Hudson westbound train SUX9 behind GP39-2 7414, 7405 & 7415 approaches the NY-7 overpass after meeting train SUX2 at Cobelskill, New York, on a sunny 28 September 1980. Title: D&H Hudson Yard, in Hudson, Pa. Description: D&H Hudson Yard, in Hudson, Pa. 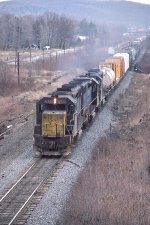 Description: A Westbound Guilford train with a D&H, B&M, and MEC unit for power. Description: D&H in East Side Yard.